Houzz’s recently published its 2018 Kitchen Trends Study and many homeowners are looking to remodel their kitchens or to find ways to declutter. Accuride can help with both of these with convenient and reliable movement solutions for any kind of kitchen storage. Products like Accuride’s Flipper and Pocket Doors, Medium-Duty drawer slides, Undermount drawer slides, and a Linear Track System can all help you find creative ways to remodel your kitchen. Houzz is one of the top online resources about home interior design. With that cachet, small wonder that whenever the site publishes a new survey, people in the industry listen. So it is with Houzz’s recently published 2018 Kitchen Trends Study, which surveyed over 1,700 respondents. Houzz compiled its survey into a 38-pg. illustrated report divided into seven sections (including Methodology and Appendices). Engineered quartz is the top material for countertops for the third year running. An overwhelming majority–94%–of respondents said they replaced their countertops, and 42% said they splurged when it came to replacing those tops. While that’s good for quartz, granite has slid in popularity from 43% in the 2016 survey to 34% in 2018. San Francisco is already notorious for the high cost of living, and so it has the distinction of having the most expensive kitchen renovations. Of the top 20 US metro areas, San Francisco ranked the most expensive with an average cost of $70,000 for major renovations. By comparison, runner-up Philadelphia has a substantially lower average of $55,600. The biggest reason homeowners are remodeling their kitchens: They detest their old ones. Over 40% of respondents said they could “no longer stand the old kitchen.” Nearly the same number said they’re adding a kitchen island for their remodel. 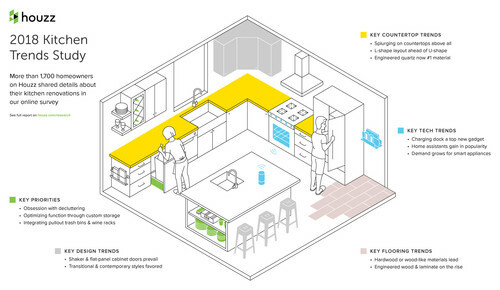 More homeowners are also embracing a fresh kitchen layout: L-shaped layouts account for 35% of remodels, followed closely by U-shaped and well ahead of galley, single-wall, and G-shaped layouts. Of these, pullout waste and recycling cabinets accounted for 67% of new additions to kitchens, followed by cookie tray, deep-drawer, and pull-out trays. See more of solutions on our Homeowners Page! Of course, these takeaways only touch lightly upon Houzz’s comprehensive survey. Perhaps the biggest theme to emerge has been one of aesthetic and functional efficiency. Technology, such as smart appliances and assistant devices, and movement innovation, from pullout bins to hideaway organizers, are giving kitchens a clean design without compromising versatility. Are you planning to renovate your kitchen? Let Accuride be your resource for creating a moving, space-saving interior! Our experts can help you with useful suggestions for crafting a beautiful, clutter-free interior. Just reach out to us on our contact page or social media to learn more! We recommend you download and read Houzz’s full report. In the meantime, stay connected with Accuride.